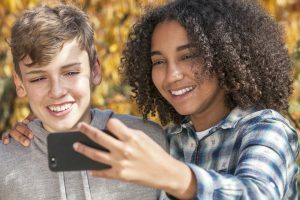 In this digital age, one of the biggest questions on the mind of parents is “What age is appropriate to give my kid a smartphone?…or When should I let my kid have _____ app?” The first thing to note here is this: there is no silver bullet answer. For apps, there are age recommendations/restrictions put on them (for example 17+ for YouTube and Twitter), but when you see those restrictions, they should only serve as a factor in answering the question on if my kid should have this app. In other words, it shouldn’t be the underlying factor. But sadly, there’s no silver bullet answer on knowing when my kid should have a smartphone or not. There’s no easy answer because every kid is different, every parent is different, every kid’s friend circle is different; your involvement in your kid’s life plays a factor, some kids are super addictive in nature, introverted/extroverted, self-driven vs. other’s driven, some are more rebellious than others, some have a lot of friends and others have few friends, some are academically gifted while others are more athletically gifted. I could keep going, but I’d like to point out the heart behind the question is: you want to protect your kid as best as you can and for as long as you can. The heart behind it is I WANT MY KID TO BE SAFE AND SMART, when it comes to all things digital, especially a smartphone. And that’s a good motivation! You love your kids; therefore you want them to be digitally safe and smart. Is my kid prone to being highly addictive: video games, youtube, sports, academics, food, etc. What happens when you take something away from them? How do they react? What kind of friends does my kid typically hang around? 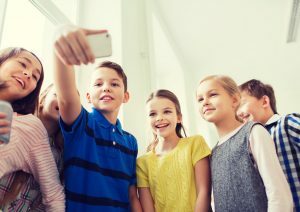 (You are who you hang around; your friends will influence your digital life) This doesn’t mean to get rid of all friends who are questionable or potentially a bad influence, but your kid’s friend group is a factor to consider when trying to figure out if they’re ready for a smartphone or a particular app. Do they show signs of being honest with you? Or do they hide a lot of things from you? One more test, less about maturity. But this is the Test of Reality: does my kid talk about wanting a smartphone or wanting Snapchat or Instagram or whatever app? Because if so, there’s a reason why they want it; their friends have it. And if their friends already have it, chance are your kid already knows more about that app than you think they do. Consider the age restrictions: For apps, look at the age restriction to see what the app suggests as appropriate. Know the apps: Before you give your kid the device/app, you should have it first and play around with it: get familiar with it. 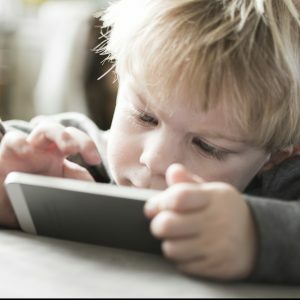 Know the device/app well before you give your kid access to it. Start Small and Slow: maybe give them access to one social media platform, then when they show signs of more maturity, they can earn more platforms. If they want access to something, maybe they can only have access to it on your phone. Same thing with devices: maybe start with a “not so smart” phone and earn your way to a smarter device. Sign a Social Media Agreement Contract together: set clear hopes, expectations, and boundaries you have when it comes to their usage of this app or device…and make it clear what happens when they break any agreed upon boundaries. We’ve created a social media agreement here. Stay involved: lean into this area of their life instead of check out. Have open communication with them about all things technology. The more involved you are, the more you can see if they are mature enough for that device. If you choose not to give your kid a smartphone, you should still have conversations with them about a smartphone and your expectations. The earlier you start these conversations, the better. Why? Because it’s always better to be proactive vs. reactive.